In late 1814 New Orleans was home to a population of French, Spanish, African, Anglo and Creole peoples dedicated to pursuing economic opportunism and the joys of life. It also occupied a strategic place on the map. Located just 100 miles upstream from the mouth of the Mississippi River, the Crescent City offered a tempting prize to a British military still buoyant over the burning of Washington, D.C. To capture the city, Admiral Sir Alexander Cochrane fitted out a naval flotilla of more than 50 ships to transport 10,000 veteran troops from Jamaica. They were led by Sir Edward Pakenham, the 37-year-old brother-in-law of the Duke of Wellington and a much-decorated general officer. For protection, the citizens of southern Louisiana looked to Major General Andrew Jackson, known to his men as "Old Hickory." Jackson arrived in new Orleans in the late fall of 1814 and quickly prepared defenses along the city's many avenues of approach. Meanwhile, the British armada scattered a makeshift American fleet in Lake Borgne, a shallow arm of the Gulf of Mexico east of New Orleans, and evaluated their options. Two British officers, disguised as Spanish fishermen, discovered an unguarded waterway, Bayou Bienvenue, that provided access to the east bank of the Mississippi River barely nine miles downstream from New Orleans. On December 23 the British vanguard poled its way through a maze of sluggish streams and traversed marshy land to emerge unchallenged an easy day's march from their goal. Two American officers, whose plantations had been commandeered by the British, informed Jackson that the enemy was at the gates. "Gentlemen, the British are below, we must fight them tonight," the general declared. He quickly launched a nighttime surprise attack that, although tactically a draw, gained valuable time for the outnumbered Americans. Startled by their opponents' boldness, the British decided to defer their advance toward New Orleans until all their troops could be brought in from the fleet. Old Hickory used this time well. He retreated three miles to the Chalmette Plantation on the banks of the Rodriguez Canal, a wide, dry ditch that marked the narrowest strip of solid land between the British camps and New Orleans. Here Jackson built a fortified mud rampart, 3/5 mile long and anchored on its right by the Mississippi River and on the left by an impassable cypress swamp. While the Americans dug in, General Pakenham readied his attack plans. On December 28 the British launched a strong advance that Jackson repulsed with the help of the Louisiana, an American ship that blasted the British left flank with broadsides from the river. Four days later Pakenham tried to bombard the Americans into submission with an artillery barrage, but Jackson's gunners stood their ground. The arrival of fresh troops during the first week of January 1815 gave the British new hope. Pakenham decided to cross the Mississippi downstream with a strong force and overwhelm Jackson's thin line of defenders on the river bank opposite the Rodriguez Canal. Once these redcoats were in position to pour flank fire across the river, heavy columns would assault each flank of the American line, then pursue the insolent defenders six miles into the heart of New Orleans. Units carrying fascines -- bundled sticks used to construct fortifications -- and ladders to bridge the ditch and scale the ramparts would precede the attack, which would begin at dawn January 8 to take advantage of the early morning fog. It was a solid plan in conception, but flawed in execution. The force on the west bank was delayed crossing the river and did not reach its goal until well after dawn. Deprived of their misty cover, the main British columns had no choice but to advance across the open fields toward the Americans, who waited expectantly behind their mud and cotton-bale barricades. To make matters worse, the British forgot their ladders and fascines, so they had no easy means to close with the protected Americans. Never has a more polyglot army fought under the Stars and Stripes than did Jackson's force at the Battle of New Orleans. In addition to his regular U.S. Army units, Jackson counted on dandy New Orleans militia, a sizable contingent of black former Haitian slaves fighting as free men of color, Kentucky and Tennessee frontiersmen armed with deadly long rifles and a colorful band of outlaws led by Jean Lafitte, whose men Jackson had once disdained as "hellish banditti." This hodgepodge of 4,000 soldiers, crammed behind narrow fortifications, faced more than twice their number. Pakenham's assault was doomed from the beginning. His men made perfect targets as they marched precisely across a quarter mile of open ground. Hardened veterans of the Peninsular Campaign in Spain fell by the score, including nearly 80 percent of a splendid Scottish Highlander unit that tried to march obliquely across the American front. Both of Pakenham's senior generals were shot early in the battle, and the commander himself suffered two wounds before a shell severed an artery in his leg, killing him in minutes. His successor wisely disobeyed Pakenham's dying instructions to continue the attack and pulled the British survivors off the field. More than 2,000 British had been killed or wounded and several hundred more were captured. The American loss was eight killed and 13 wounded. 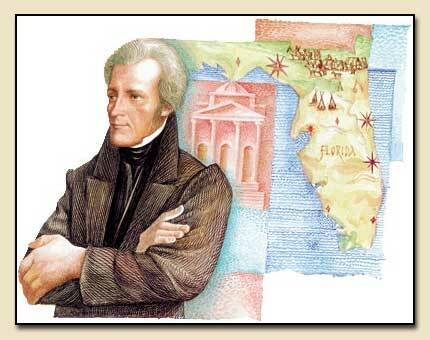 Jackson's victory had saved New Orleans, but it came after the war was over. 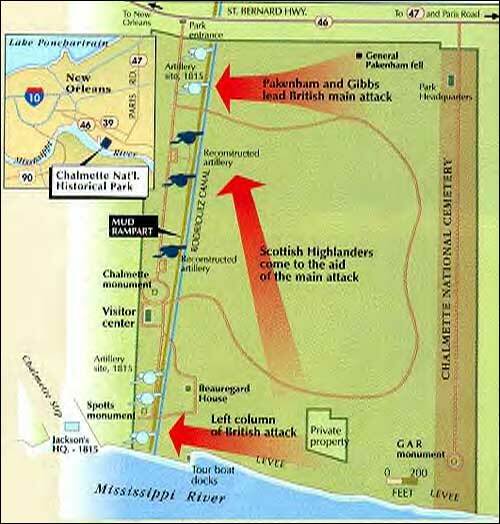 The Treaty of Ghent, which ended the War of 1812 but resolved none of the issues that started it, had been signed in Europe weeks before the action on the Chalmette Plantation. -A. Wilson Green is the former manager of Chalmette National Historical Park.